Now, a date wouldn't be a date without some food... :0) Actually, that's not true, but when you NEVER get to go out to a civilized, peaceful, quiet meal, that's what you do! 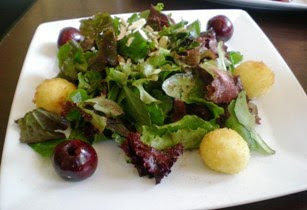 Salad with Cherries, Cherry Balsamic Vinaigrette & Goat Cheese Fritters - the salad was perfectly dressed with just the right amount of vinaigrette and the goat cheese fritters were nice and crispy on the outside and creamy and slightly tangy in the middle. 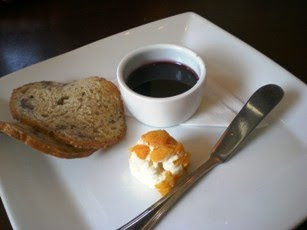 And we ended the meal with Artisan Goat Cheese with Apricots, Walnut Bread & Red Wine Caramel Sauce - the cheese was possibly the smallest portion of cheese I have ever seen! But the combination of the walnut bread, the pleasantly sweet sauce & the cheese was perfect. And it was just enough as we were quite full from the other food. Questions: What did you do this weekend? What book(s) are you currently reading? so glad you got some quality time in with your honey - i babysit for couples a lot and they always seem so happy when they come home! I'm so glad you got to get out the house with your husband and enjoy a very delicious looking linner! I know I need to start cherishing the fact that Nick and I go on a date at least once a week. For me, that's not enough, but good lord I need to start thinking realistically if I ever want to have children! I'm right now reading Jodi Picoult's Nineteen Minutes. As usual, pretty chilling and depressing...but SOOO good! 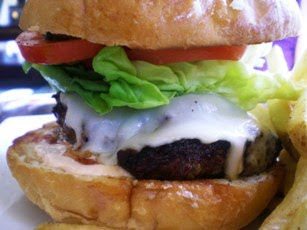 "Linner" looked really good! As you know, we saw Julie & Julia this weekend and, as far as books go, I'm just starting "Memoirs of a Geisha"--I'm sure it'll be good! Emily Giffin -- she's one of my favorite authors. I'd recommend any of her three other books, too. I also got "I'm So Happy For You" by Lucinda Rosenfeld. your food pics look AWESOME... WOW! I heart uninterrupted reading time - I read all day Sunday! 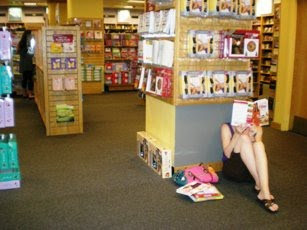 I'm reading The Time Traveler's Wife, The Undomestic Goddess and HOlly's Inbox! Wow everything looks so deliciousm I love the pictures! I just got done reading The Time Travelor's Wife...SO GOOD! 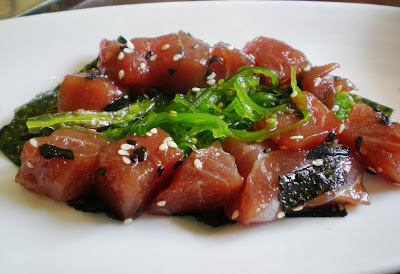 I want some of that Tuna Poke! :) I'm glad you guys had a good time! How fun you got to have linner together all alone AND that you didn't wait another two years to out together! It's def. important to make time for each other, something we have to remind ourselves of over here too. Glad to hear you finally had some alone time with hubby. My sister struggles with that with her hubby and 2 year old. I'm trying to be better at babysitting for her. I like the word linner...so much better than Lupper!